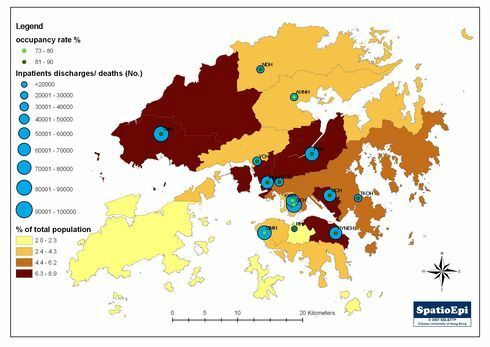 Data source: Hospital Authority, Hong Kong. The map shows the current (2009) distribution of General Outpatient Clinics (GOPCs) operated by the Hospital Authority in the public service in Hong Kong. These clinics represent the first points of contact for people presenting with minor ailments, chronic diseases, or acute problems which usually do not require hospitalisation. The clinics are concentrated in urban districts. For the convenience of working population, some clinics open in the evening or over Sundays or Public Holidays, as reflected by the symbols in the map. 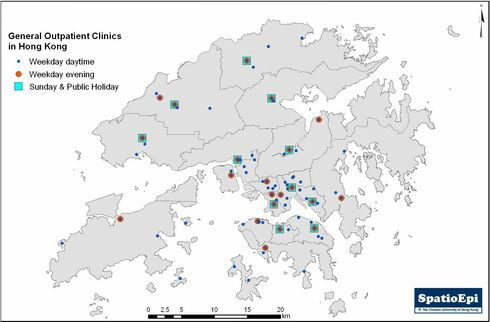 This map does not show the locations of private clinics, which in fact is responsible for a majority of primary care consultations in the territory of Hong Kong. Data were obtained from the Hospital Authority which runs the GOPCs. In Hong Kong, 73 General Outpatient Clinics (GOPCs) are operated as public service by the Hospital Authority. They provide affordable general outpatient service to the public. Most of them open in the mornings and the afternoons from Monday to Friday, as well as on Saturday mornings. Twenty-one of these are also evening clinics. Besides, 11 GOPCs open during Sundays and public holidays. This means that the service is generally available throughout the whole year. To alleviate the early morning queues outside General Out-patient Clinics (GOPCs), the Hospital Authority has introduced the phone appointment service in October 2006.